These savory brown rice balls filled with butternut squash, fresh sage, lemon zest, and Parmesan cheese are an indulgent side dish or hors d’oeuvre not to be missed! This week the USA Rice Federation is sponsoring a recipe contest with The Recipe ReDux to encourage people to “Think Rice” during National Nutrition Month, which goes on throughout the month of March. When I read that they are looking for our “nutritious and delicious recipes that feature U.S.-grown rice” I knew it was meant to be for me to enter the contest. After all, Nutritioulicious is what this blog is all about! I have to admit that rice isn’t my go to grain and I often have a hard time cooking it perfectly. I confessed that when I shared my Shorty’s Brown Rice recipe last January, a rare occasion when my rice came out so good I needed to post it. That said, there are so many great reasons to cook with rice and regardless of which type of rice you prefer, they all have a place in a balanced diet. One of my favorite rice dishes is an Italian appetizer called arancini, also known as risotto balls or rice balls. Traditionally these stuffed rice balls are made with Arborio rice, coated with flour, egg, and breadcrumbs, and deep fried, making them an indulgence I have only enjoyed at restaurants. So what better time to experiment with making a healthier version of this Italian specialty than a USA Rice sponsored Recipe ReDux contest?! 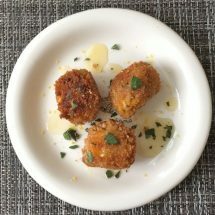 My version of arancini is made with U.S.-grown short-grain brown rice, coated in egg whites and whole wheat Panko breadcrumbs, and pan-fried in canola oil. Plus, the rice is mixed with butternut squash, which adds vitamin A and fiber to the rice balls, and chopped sage, which adds a fragrant aroma and flavor. I served them with a drizzle of lemon honey, which brought out a little more sweetness from the squash. 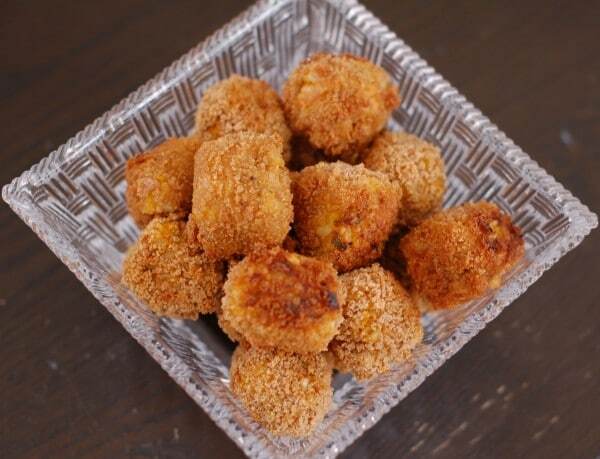 These risotto balls can be served as a side dish or an hors d’oeuvre at a cocktail party. Regardless of when and how you serve them, they will surely be a hit! These savory brown rice balls are crisp on the outside and soft and gooey on the inside. Filled with butternut squash, fresh sage, lemon zest, and Parmesan cheese, they are an indulgent side dish or hors d'oeuvre not to be missed! Bake butternut squash at 400 degrees F for 40 minutes until soft enough to mash. Scoop flesh (discarding seeds if using a whole squash) and mash as smooth as possible. Set aside. While squash is cooking, start making risotto. In a small saucepan, bring vegetable broth to a simmer. Keep stock warm over low heat. Heat oil in a large saute pan over medium heat. Add shallots and garlic and cook about 2 minutes, stirring until softened. Add rice, stirring frequently for 2 minutes, until lightly toasted. Add wine and stirring occasionally cook until liquid almost evaporates, about 4 minutes. Add 1 cup of simmering stock to rice and cook over medium heat until liquid is nearly absorbed, stirring occasionally, about 4 minutes. Add remaining stock 1/2 cup at a time, stirring occasionally until each portion of stock is absorbed before adding the next, about 30 minutes total. In a small bowl, whisk together honey and lemon juice. Set aside at room temperature. Place egg whites in one shallow bowl and Panko in a second shallow bowl. 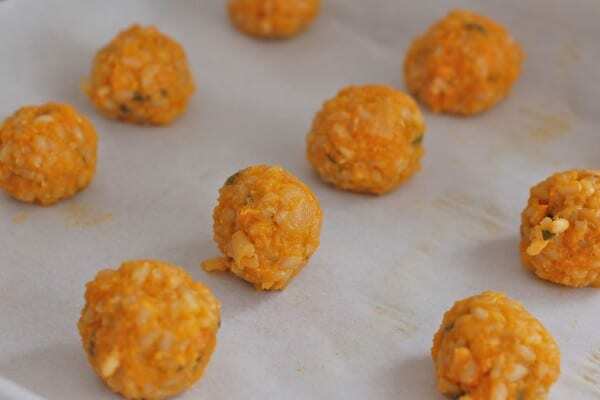 Prepare a parchment-lined baking sheet for the risotto balls. Using a tablespoon, scoop cooled risotto and roll into a ball. Dip risotto ball in egg white and roll in Panko. Set aside on prepared baking sheet and repeat for remaining risotto. Heat 2 tablespoons canola oil in a large skillet over medium-low heat. When oil is sizzling, place risotto balls one by one into the oil, turning about every minute to evenly brown (3-4 minutes total). Remove and drain on a paper towel lined plate. Repeat for remaining risotto balls adding oil as needed. (I pan-fried 8 risotto balls per batch and used a total of 6-8 tablespoons oil). Serve hot, drizzled with lemon honey and sprinkled with lemon zest and sage. Alternative method: Bake risotto balls at 425 F for 25-30 minutes, turning every 10 minutes for even browning. The result is a drier, crunchier risotto ball, but still very good! Do you have a favorite rice recipe? What’s your favorite kind of rice to eat? Get inspired with more US-grown rice recipes from my fellow Recipe ReDuxers below! Oooh – I just adore this recipe and digging the flavors you got going on here. I’ve never made risotto balls before but am definitely trying this one out – pinning now. Thank you Sonali! A little labor intensive, but worth the outcome! I’m so glad you reminded me about these! I love that you made the risotto with butternut squash- that’s awesome! It’s so funny because I forget about this recipe too (seems to happen a lot when I’m always making new things! ), and reading through it I’m thinking why didn’t I make these this whole winter?! Oh, well, guess I’ll have to remember next year. Also fun to look back at the comments and see you had never made risotto balls at home before – now that’s not true anymore! Haha… From your mouth to the judges ears! Obviously we both our huge risotto lovers! I am definitely going to try your recipe. I love how you added sage and butternut squash- makes me think of my favorite ravioli! Is there anyone who doesn’t like risotto?! Lol! Thanks so much! Love arancini and these look so indulgent and delicious! Have never tried to (or thought about) making them at home, but now I just may have to. Thanks Jenny! Hope you enjoy them if you get a chance to make them! These look so delicious! Love all the savory flavors you used! Love how you added the flavors of butternut squash and sage in these – YUM. This is definitely a comfort food I’m craving currently. Thanks Alanna! Comfort food for sure! Yummm! These look like a delicious appetizer!! I love arancini and these sound amazing. Using the butternut squash is such a great idea to add flavor and creaminess. I will be trying this recipe. What a perfect appetizer! Thanks so much Marisa! Hope you enjoy them! I love how creative this is!! 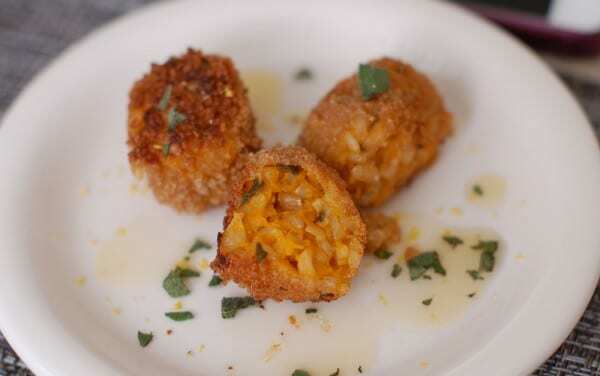 I have never made risotto balls but I love how you incorporated butternut squash. Pinning for sure! Thanks Selena! I had never made them before, but have wanted to. This was the perfect chance! Arancini are my favorite, and with the squash and the sage, these look absolutely to die for. YUM! Thanks! My kids do too and loved these! Thanks – they are so delicious! Best of luck to you too!